There are millions of inactive oil and gas wells in the U.S. Could they be given a second life in energy storage? 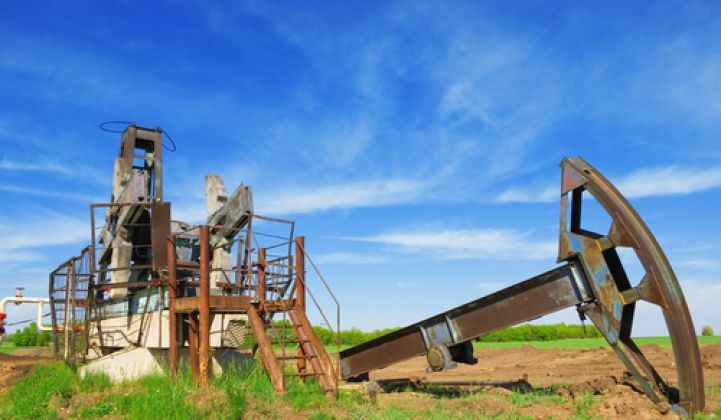 Definitive estimates are hard to come by, but according to one study, there could be at least 2.7 million inactive oil and gas wells in the United States. What if some of them could be used to store energy? That was the question posed by Michael Campos at the ARPA-E Energy Innovation Summit held last month in Washington, D.C. Campos is an ARPA-E fellow whose research focuses on energy storage, advanced materials and automation. Campos’ interest in repurposing abandoned wells as “electron reserves” stems from two observations. In abandoned oil and gas wells, one has a potentially ready-made storage container. It's possible to improve the economics of energy storage by avoiding the cost of mining a salt deposit to create a cavern to hold hydrogen, compressed air or water. And as more variable renewable energy is added to the grid nationwide, grid operators will need seasonal and long-duration energy storage. “When we talk about seasonal time scales and doing storage in geological formations, we want to go with the absolute cheapest types of storage possible,” Campos told GTM in a recent interview. Campos’ concept is focused on three types of well-based energy storage. Geologic hydrogen: This refers to underground storage of hydrogen gas. Researchers at Sandia National Laboratories recently found that above-ground tank storage of hydrogen costs three to five times more than geologic storage and “above-ground tanks can’t even begin to match the amount of hydrogen gas that can be stored underground.” One scenario could include hydrogen stored in a depleted well co-located with wind turbines as part of an integrated power-to-gas system. Surplus electricity from the wind farm could be used to produce hydrogen via an electrolyzer. Hydrogen stored in the well could then be used to power fuel cell vehicles or to generate electricity via a stationary fuel cell. But challenges remain. “A depleted well is not a shiny stainless-steel container,” noted Campos. There will be some leakage and some impurities added to the hydrogen. Based on the Sandia Labs research, Campos estimated that using depleted oil and gas wells instead of a mined salt cavern to store hydrogen could yield a 25 percent savings. Compressed air: Here, pressurized ambient air would be stored in the depleted well. To produce electricity, the air is heated, and it expands into an expansion turbine that drives a generator. The challenge, said Campos, is the thermodynamics of compression and expansion. When you compress the ambient air for storage, it releases heat. If some of that heat can be stored over the long term, he said, it could be used to reheat air in the expansion phase. Residual natural gas in the well could also be tapped for use in the reheating process. Pumped hydro: This technology is cheap, it’s safe and it’s mature, said Campos. The problem, at least above ground, is that it can be difficult to site. But if you were to place a piston in the shaft of a depleted well and store water underneath, you’ve recreated a water basin equivalent to an above-ground upper water reservoir. The piston, pushed downward, would force water into a penstock. The water would then flow toward the surface, and through a turbine to generate electricity, before returning to the well to start the cycle anew. Campos is the first to admit that repurposing abandoned oil and gas wells as electron reserves is an early-stage concept. It may be nascent, but Campos’ proposal has piqued the interest of relevant stakeholders. “Before my pitch, and since my pitch, I’ve been in contact with various people who are in oil and gas or energy storage — or sometimes dipping their toes into both — and most people I’ve talked to have been very interested in this,” he said. Campos identified the need for additional research in three areas to move the concept forward: finding optimal locations for deployment, understanding what parameters you’re dealing with via storage simulations, and developing more forgiving power conversion devices. The good news, said Campos at his ARPA-E summit pitch, is at the level of the individual well, the composition of that “container” is relatively well understood. “Decades of oil and gas R&D have given us advanced surveying and drilling capabilities such that we have a pretty good idea of what’s underground. For wells that have already been explored, most of the hard work has already been done,” he said.